My kids don’t get screen time. The American Academy of Pediatrics recommends that children under 2 years old don’t get any screen time, for older toddlers and children they recommend limiting exposure. The reality of children is very different. According to a story on NPR’s Mind/Shift, research by Dr. Dimitri Christakis, Director of the Center of Child Health, Behavior and Development at Seattle’s Children Research Institute, shows that preschoolers in the U.S. get 4 1/2 hours of screen time a day. Two of which are while they are in childcare. Considering that children at this age are awake for around 12 hours a day, this seems like a lot of time to me, but also to experts who argue that this is not only problematic because of what they are doing, but because of what they are not doing. While they are watching T.V,–or on an iPad–they are not interacting with other kids and adults, they are not being active and they are not playing, which is they way they learn. I am not here to judge anyone, I am a mom too and I know how hard it is to get anything done while you have kids literally holding on to each of your legs. Letting kids watch an age appropriate show is hardly something anyone should feel guilty about. But it seems like a lot of kids are getting more than just one or two episodes of their favorite show per day. I grew up watching a lot of T.V. I woke up early on weekends and watched one show after another before my mom and sister woke up. I also watched T.V. right after school, and in the evenings after dinner. Most of the time I was watching T.V. alone, and watching shows that were probably not appropriate for my age. Even after all of that, I am fine, although I could have gotten better grades in school. I don’t have any major issues, I enjoy reading and have several hobbies, and I like to think I am a good person. Without blaming my parents in any way for letting me watch so much T.V., I want something different for my kids. In order to make our home a screen-free area for the kids, they are 3 and 1, this is what we do. TV is not an option: When the kids are up, the T.V. is off. There are many days when I’d like to turn on a morning show and catch up on the news, but I just don’t do it. I catch up on what is going on later in the day, and thank all of my Facebook friends for sharing newspaper articles, which I often read at 3 a.m. when I am waiting for my baby to wake up–I still have some of that lovely pregnancy insomnia, even though my baby is 1. We promote independent play: One of the reasons why T.V. is used to “babysit” kids is that it is sometimes the only way to get things done, things that need to get done like making dinner. Since my kids were babies we’ve let them play on their own while we do other things nearby. If they need me, or want to ask me something, I am right there for them, but they are able to entertain themselves without me while I prepare meals, put clothes away or make beds. Having a play room, as well as a box of toys in our main floor makes this easier. 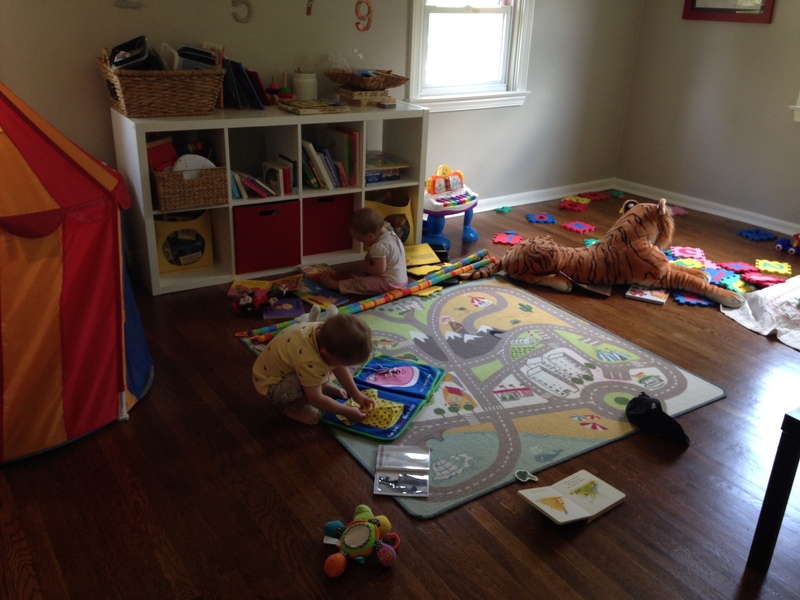 This is what independent play looks like in our house; messy, but calm. We go out: We are fortunate to live in a house in a safe neighborhood, and we take advantage of the space we have by spending as much time outdoors as possible. Sometimes we go out straight from nap time and don’t come back in until it is time for dinner. My kids love eating their snack outside. We don’t have games in our phones: Both my husband and I have smart phones, I also have a tablet, but there aren’t any games or kids’ apps in them. Our kids sometimes take our phones and “play” with them, which means they are looking at pictures of themselves and their cousins. I limit this as well, and realize that the more I look at my phone, the more my kids want it. I am working on this. The above doesn’t mean my kids never ever watch T.V. In fact, there have been occasions when I have used it to entertain/keep them busy, like when we are at my dad’s house, which is not child-friendly, and I need to do something, or when they are sick. There was also a time when I had a phone interview and no childcare. Last winter we cuddled under a blanket and watched a movie on a couple of occasions, my son sometimes talks about the time we went to a school fundraiser that included watching a movie and eating popcorn. During plane rides, movies and my smart phone give me some sanity. I have noticed that after each of these instances when they do, my son asks to watch T.V. more often. Then when we’ve spent a good amount of time without it, he stops asking. This is why we don’t have any kind of screen time allowance. As for myself. I feel like I still watch a lot of T.V., and check my phone too often, but I am trying to get better. What is it like in your house? Do you struggle with keeping your kids screen-free? Do you not worry about it? I’d like to know how it is for you. There is a part of me that thinks that maybe they should be exposed to more pop culture through media, but I also think that there will be time for that as they grow up and go to school. Love this. I don’t have kids of my own (yet, due soon!) but I am always looking for ways to not use tv for entertainment when hanging out with my nieces and nephews. Although, I definitely think TV time can be reserved for special occasions (movie/popcorn nights… sick days… etc). I definitely want to be a mindful momma when it comes to tv/screen time entertainment, which also will hold me accountable to the time I spend personally on my phone, tablets, or in front of the tv! Congratulations! Having a child will rock your world in many wonderful and challenging ways. I feel the same way, movie nights can be so fun and so special for the family. Good luck and thank you for reading. My 3 year old has more screen time than I’d like but I try not too stress out about it. I feel it’s balanced with lots of more engaging play but I do feel a twinge of guilt about using the “virtual babysitter”. But sometimes I just need to get things done! 😉 We did hit the 2 year mark without screen time, as recommended, but then it seemed to become a thing really fast. I realized I had to be aware of how much I was looking at my phone or tablet because that made it all the more fascinating for him. A tough issue all around. Thanks for the thoughtful post!